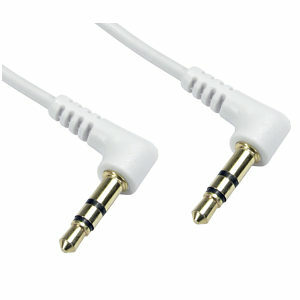 10m White 90 Degree Angle 3.5mm Stereo Jack Cable. 6m XLR socket to 1/4 Inch Jack Plug Cable, mono (TS) unbalanced audio cable 3 pin XLR socket to mono 1/4 inch jack plug. For mono audio applications. Ideal for microphone connections. Features flexible, fully screened cable with pure copper conductors. Length 6 meters. 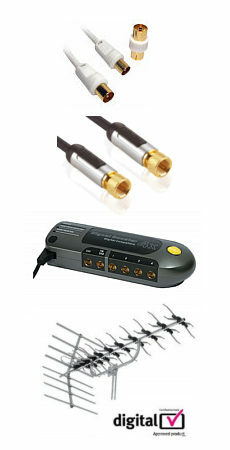 High quality optical lead, 2m, TOS plugs have an attractive black finish and gold plated inner pin. TOSLINK cables are commonly used for optical interconnect between devices such as DVD players and Home Cinema amplifiers, also suitable for PS2 etc. A single TOSLINK cable is capable of transporting a full multichannel digital audio stream such as Dolby Digital 5.1 or DTS. VGA to component video cable, 10m long. VGA to YPbPr cable 10m. ideal for projector connections. HD15 SVGA / VGA connector to 3 x phono male RGB component. RGB colour coded plugs. Gold plated contacts Pure copper conductors for perfect picture transfer. HD compatible. Length 10m Please note that not all VGA / SVGA connectors will be compatible with component video, for example a PC will most likely output only RGBHV, please ask for advice if not sure.